Back to back months of the second and third best months ever on record with 1,638 transactions in June and 1,629 in May makes 2016 the most active year for the first six months and second quarter. Only May 2007 is higher than this June at 1,652 sales. The next busiest second quarter on record was in 2008 when again there were back to back outstanding monthly results with May and June each recording 1,564 sales. Condo prices were not expected to see any discernible difference in 2016 if not facing some downward pressure owing to the abundance of MLS® listings and new condo supply on the market. They have decreased very modestly at this stage. The average year-to-date price for single family homes and condominiums is $306,311 and $232,507 respectively. Of course depending on the property type you have, its location, the number of competing similar property types with their own strengths and weaknesses, you need to be talking to an expert – a REALTOR® – who can advise you on what you need to do to maximize your chances of achieving the best price possible. For buyers a REALTOR® will be indispensable in imparting critical market intelligence on what prices they can expect to see in the current market for the property type they are interested in purchasing. Single family homes in particular are enjoying an exceptionally strong year, especially the last two months. 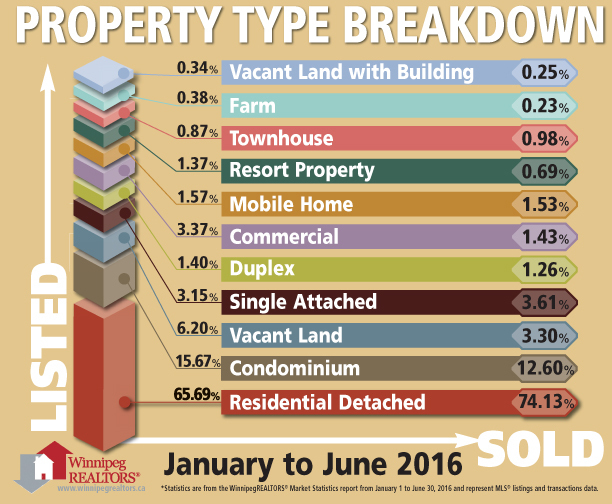 Within some Winnipeg neighbourhoods there are not enough listings to meet existing demand. Fort Garry, Norwood, Windsor Park, Whyte Ridge, Crescentwood, Linden Woods, East Kildonan and Crestview are areas where we are seeing more sales in a month than the number of listings remaining on the market at the beginning of the next month. Condominiums on the other hand are not enjoying near the same extent of sales to active listings conversions. This in part explains why there is less above list price sales than single family homes. The most active price range in June for residential-detached sales was $250,000-$299,999 (22% of sales), followed by the $300,000-$349,999range (17%) and the $200,000-$249,999 (15%). 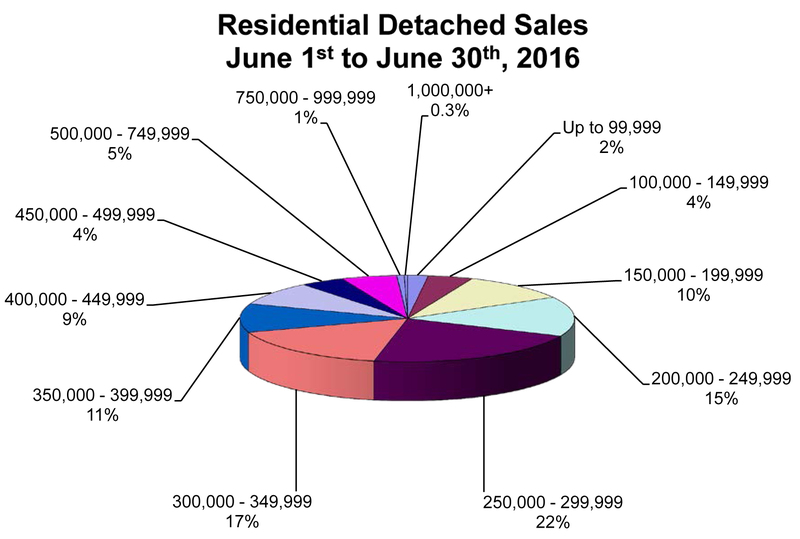 Average days on market for residential-detached sales was 26 days, 3 days quicker than June 2015. The highest priced residential-detached sale was $1,450,000 and the least expensive sale was $35,000. The most active price range for condominiums was $200,000-$249,999 (26% of sales), followed by the $150,000-$199,999 range (23%) and the $250,000-$299,999 range (17%). Average days on market for condo sales was 43 days, a turnaround that is 6 days quicker than June 2015. The highest priced condo sold for $645,000 while the lowest was $66,000.